Individual Villas with Private Pools Located on the golf course, in the hills, near the tennis centre, these superb villas all have private pools. Los Olivos is centrally located right opposite the 28 court tennis centre. A modern community with 2 outdoor pools & 1 indoor heated community pool. Stylish apartment living, they have terraces with built-in BBQs. Great views. Monte Claro Pueblo is centrally located no more than a few minutes walk from tennis centre. A modern development of just 16 townhouses with lovely community gardens and pool. Los Naranjos 1 is centrally located just a few minutes walk from tennis centre. In a quiet cul-de-sac of detached individual villas with private pools and gardens. These villas offer super accommodation at the heart of the Resort. Los Naranjos 2 is a pueblo style community of modern detached and semi-detached villas set around two outdoor community pools, one heated. It is in a great location no more than a few minutes walk from tennis centre. Monte Verde is a development of modern detached villas, some with private pools, and apartments. In a quiet location with spectacular views, residents have the use of three community pools, two outdoor and one indoor. South Course Individual Villas with Private Pools Beautiful villas with private gardens and pools, in and around the South Course. Monte Claro Individual Villas with Private Pools Beautiful villas with private gardens and pools, in a great central location near to the tennis centre. North Course Individual Villas with Private Pools Beautiful villas with private gardens and pools, in and around the North Course. Car hire recommended. Las Mimosas is one of the newest communities, centrally located just a few minutes walk from tennis centre. Each detached villa has a private pool and garden. These villas offer modern living at the heart of the Resort. Las Palmeras Centrally located apartments a few minutes walk from tennis centre, facing the picturesque Par 47 pitch & putt course. With a community pool, patio area and gardens. Los Altos 2 Spanish style, centrally located on the hill behind the tennis centre. Detached and semi-detached villas with great views. Use of three community swimming pools. Los Molinos Los Molinos or 'The Windmills' is a charming community. It's community swimming pool with waterfall, separate children's pool, poolside bar and seasonal restaurant is it's focal point. El Rancho El Rancho is a popular community of Spanish style villas, many with great views. There are a total of 9 community pools, each with a children's pool, making it an ideal location for families. La Colina La Colina is centrally located behind Los Olivos within easy walking distance of the tennis centre. The properties are built round an attractive community pool with children's section. They also have their own terraces and BBQ facilities. Las Brisas Las Brisas is a modern development comprising of individual villas with private pools and townhouses with use of community pools. Situated in beautiful landscaped gardens near to the South golf course. Terrazas de Montemares Las Terrazas de Montemares is a community of modern townhouses, situated in an elevated position behind El Rancho. They are set around a large freeform community pool and well cared for gardens. Bellaluz Well located within the Resort, the Bellaluz apartments are built around a central plaza with shops, restaurants and bars. Residents can enjoy the large children’s pool and a 25 metre swimming pool, set in community gardens and terraces with a poolside bar which is open during the summer months. Los Altos 1 Centrally located next to Los Olivos and a few minutes walk from tennis centre. This community of Spanish style semi-detached and detached villas have the use of two pretty community pool areas. El Pinar El Pinar is a modern community of apartments, set at the top of the hill in the centre of the Resort, with panoramic views. They are built around a community pool. Golf Bungalows Golf Bungalows are situated next to the Principe Felipe Hotel overlooking the South Golf Course. 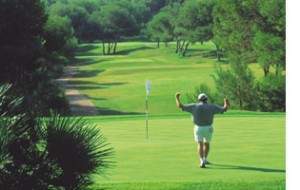 A particularly good choice for golfers, there is also a community pool and gardens for exclusive use of the residents. Las Higueras Las Higueras are a community of detached villas, each with its own private garden, private pool, terrace and rooftop solarium. They are in a quiet location approx 15 minutes walk to the tennis centre. El Coto de Golf El Coto del Golf is a peaceful community located at the northern edge of the resort. There is a mix of modern apartments and villas, with private pools and great views over the North Course. Car hire recommended. La Hacienda Del Golf is centrally located just a few minutes walk from tennis centre, yet set back and peaceful. A modern community with a large freeform community pool and level lawned gardens. The ideal location for families and sports players alike. La Quinta Club is centrally located just a few minutes walk from tennis centre, but set back in a peaceful location beside the Par 47 course. The "Club within the Club" has very good facilities, a great pool area and has regular functions at it's own clubhouse. Buena Vista The Buena Vista community is one of the newest at the Resort. Located on the hill by the North Golf Course with great panoramic views. Wthin easy distance of the facilities at Las Lomas Village, car hire is recommended. Principe Felipe Hotel at the heart of the Resort, the 5 star hotel just a few minutes walk from tennis centre and the golf club house. Many rooms with sweeping views of the golf courses. El Oasis Pool – Seasonally open to all residents in the Resort, this large pool and gardens with bar and cafeteria is the perfect place to swim or relax. Differing depth segmented freeform pool, loungers, towels and shade available. There is a charge for loungers and towels, two free loungers for residents of Miradores. La Manga Club Centre for Professional Football, offers a first-class, year-round practice facility in an ideal climate and is committed to being the best Football training centre and tournament venue for professional clubs in Europe. The excellent standard of the Football Centre, first-rate organisation and service have made it the preferred choice of a number of the world’s most important teams, both for pre-season training camps and in the run-up to important matches and competitions. La Manga Club Professional Football Centre comprises eight international-standard pitches, including a match pitch with a grandstand accommodating 800 spectators. Over recent years, it has played host to some of the world’s most famous teams and leading national squads. In addition to accommodating professional clubs, La Manga Club also offers Junior Football Academy courses during the school holidays, allowing keen young footballers to learn and play on pitches used by their idols. The 18 hole Par 47 Pitch & Putt course was designed by Severiano Ballesteros. Great for sharpening your short game skills, this picturesque course comes complete with bunkers and water hazards and offers practice and fun for the whole family. The greens are beautifully manicured, with some subtle putts. The Par 3s are particularly well designed, with excellent greens for putting, real bunkers and light rough around three holes. Handicap golfers will find plenty of opportunity to work on their short game skills and many find scoring the Par 47 shots more challenging than expected. In addition to all this, the course is beautifully landscaped with tropical palms. Si! Bar. The perfect mix of family, fun and food. Whether you’re a first time visitor to the area, or a seasoned La Manga Club holidaymaker, Si! Bar is the place to head for. Situated directly opposite security gate 2 in La Manga Club Resort, next to the football centre facility favoured for training by many of Europe’s leading teams. Si! provides a fun atmosphere where all the family can relax and enjoy good food and entertainment. 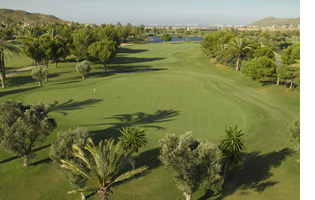 La Manga Club North Golf Course – 18 holes, par 71 – Designed by Robert Putman. 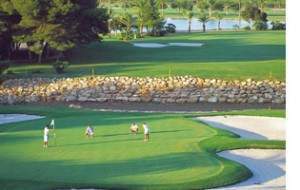 La Manga Club South Golf Course – 18 holes, par 73 – Originally designed by Robert Putman in 1971 and subsequently remodelled in 1992 by Arnold Palmer, La Manga Club’s South Course was completely refurbished in 2004. The Championship course at La Manga Club, the South, is probably one of the fairest tests of golf one can find. At 6,499 metres from the White Tees, accepted as a top-calibre championship course and provides a thorough test both for the scratch player and across the handicap range, with wide palm-fringed fairways and water hazards on 15 of the 18 holes. The strategically positioned water hazards and bunkers will certainly punish any wayward shots. The front nine are particularly tough, with two par 3’s over 200 metres and some daunting par 4’s which will demand accurate driving between lakes and bunkers, requiring long irons or fairway woods to the green. The back nine, although shorter, has a number of intriguing dog-leg holes. Special attention should be given to both the 11th and 12th holes, which demand precise club selection to greens across water. The large waste area on 14 will provide “food for thought” for most players, and is followed by the par 4, 15th, which fully justifies it’s stroke 1 rating. The stream bordering the 16th Green, now feeds a newly constructed lake protecting the front of the green, which for sure will require 100% concentration from all golfers. The par 5, 18th, with water on both sides of the fairway and a ravine just short of a well-protected green, will prove to be a particularly stern finish. The tennis centre – 28 court, multi-surface. With squash & paddle courts, gym and bar, the centre hosts Davis and Fed Cup and is a Tennis Europe Partner. Choose from many programmes to improve your game. La Manga Club Tennis Centre has played host on a number of occasions to such prestigious events as the Davis Cup and the Fed Cup, as well as ATP tournaments. La Manga Club is also an official partner of Tennis Europe. There are 28 tennis courts to choose from, including 20 clay courts, four hard courts and four artificial grass courts, as well as two paddle tennis courts and a squash court, a pro shop, equipment hire services, racket service centre, fitness centre and other services. La Manga Club’s superb tennis facilities are complemented by a top-class Tennis Academy offering excellent tuition for all ages, under the expert guidance of a team of tennis professionals. At La Manga Club tennis centre aims to provide ‘tennis for everyone’. Adult and junior tennis players will find coaching programmes tailored to their needs and level. From the informal Welcome Day on Sundays, offering free tennis and sangría, to the weekly tennis tournaments and friendly matches, helping you meet fellow players and feel part of the friendly social atmosphere at the Club. La Manga Club West Golf Course – 18 holes, Par 72 – Designed by Dave Thomas and set amid serene pine woodlands, the West Course’s design closely follows the natural contours of the undulating land. Its distinct character makes it a good alternative to the other, more classical championship courses. The West Course is many golfers’ favourite, both because of its unique setting and outstanding views and because of the challenge offered by its narrow fairways, with frequent blind shots and gullies which snake through the course. The breathtaking views, undulating fairways and fast greens make this course particularly exciting to play. Unlike a lot of courses, having played here, golfers feel that every facet of their game has been tested to the full. Especially the Par 3 holes, which are a collection of probably the best short holes to be found anywhere on one golf course. Accuracy and good golf course management as opposed to length are very much a premium.